Seoul (web team): Wooing Korean investors, Prime Minister Narendra Modi on Tuesday promised to give "personal attention" to making conditions "more conducive" for them to do business in India and and said his government was working aggressively to make India a very easy place to do business. Describing India as a "land of potentials", he said, "India is also a land of enabling policy environment. 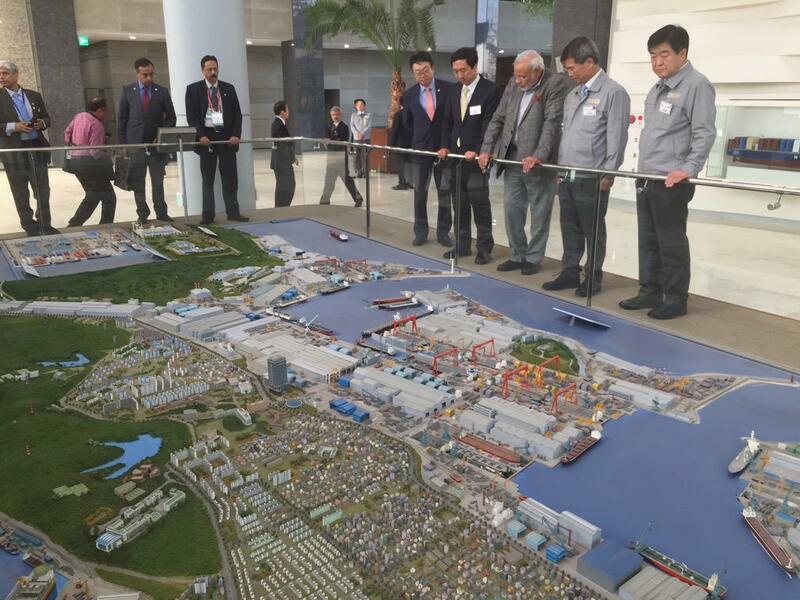 Official programmes in Korea continue: now at the Hyundai Heavy Industries Shipyard. Prime Minister Narendra Modi visited Hyundai Heavy Industries to seek increased partnership between Indian shipyards and the South Korean giant to ensure that India's shipbuilding industry can benefit from its expertise and experience. The Prime Minister, who spent about an hour, discussed various ways to expand cooperation in naval defence, LNG carrier construction and shipbuilding technology. "Shipbuilding is a top priority for us," Modi told Choi. Modi showed particular interest in HHI's technological prowess in building a wide range of naval vessels as well as high-value added vessels such as LNG carriers. Prime Minister Narendra Modi on Tuesday left for Gimhae International Airport, from where he will leave for Ulsan to see the Hyundai Heavy Industries Shipyard. Later, the Prime Minister will have a brief interaction with the mayors of Busan and Pohang in Gimhae. 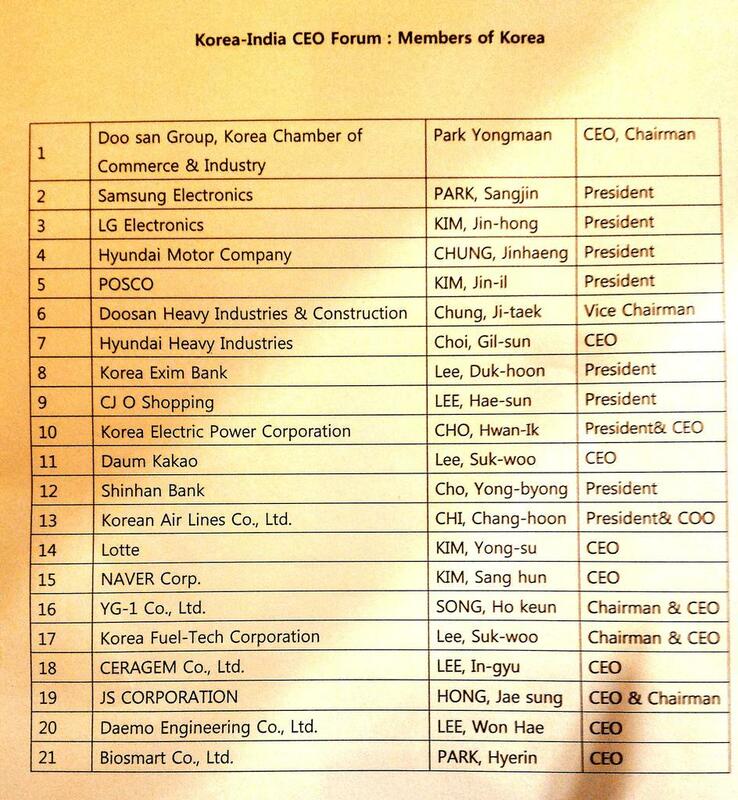 Prime Minister Narendra Modi met the CEOs of some of the top South Korean companies at the Korea-India CEO Forum here, holding a one-on-one session with each one of them. Some of the CEOs present were Samsung Electronics president Park Sangjin; LG Electronics president Kim Jin-hong; Hyundai Motor Company president Chung Jinhaeng; Hyundai Heavy Industries CEO Choi Gil-sun; Shinhan Bank president Cho Yong-byong; Lotte CEO Kim Yong-su and Korean Air Lines Co. Ltd. president and COO Chi Chang-hoon, among others.